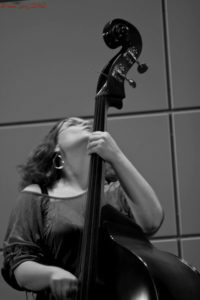 Bay Area bassist/bandleader and arts organizer Lisa Mezzacappa leads a workshop on promoting your work and developing audiences for your music, through a range of marketing tactics. Learn how to create a holistic strategy to make your concert, performance series or season, CD release, or tour a success. Topics addressed will include writing concert and series descriptions; writing press releases and communicating with the media; strategizing print and digital promotional materials; advertising; integrating social media platforms into your overall plan; and designing programs, partnerships and events with an eye to audience development. In a storied career as an academic, journalist and arts administrator, as well as an independent composer/performer, Lisa Mezzacappa has been communicating about the arts, in different formats, for more than fifteen years. She was a critic and arts reporter for a daily newspaper in New York before pursing an academic degree in ethnomusicology at UC Berkeley. She subsequently worked as Communications Director at New Langton Arts, and Marketing Manager, then Campus Programs Manager at Stanford Lively Arts. She curates the annual Jazzpop series at the Hammer Museum at UCLA, served on the curatorial committee at the Center for New Music in San Francisco, and has organized many independent music series throughout the years, including the Monday Makeout, the Best Coast Jazz Composers Series and Mission Eye & Ear. She has also been involved in strategic planning and communications strategy at Headlands Center for the Arts; has worked with the San Francisco Friends of Chamber Music as a curator and marketing consultant; and is a freelance copywriter and publicist for organizations like Cal Performances, Kronos Quartet, Levy Dance and Oakland Ballet.